A New Program Reveals How You Can Legally Bypass the Banks, Make Huge Profits in Real Estate, All While Using Other People's Money & Credit! Get a Mortgage Without A Credit Check, Banks or Lenders. And the best part is you don't have to quit your full-time job, since there are no employees to manage or rehabs to fix up. That's right! No Rehabs - No Employees. 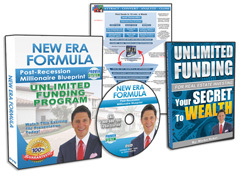 For a limited time, investors in certain qualified counties are eligible to receive the 'Unlimited Funding' Real Estate Investor's Success Kit, a $97 Value - Yours At Zero Cost. Real Estate That Others Are Taking Capitalizing On It. *The kit is free, however there is a small shipping fee of just $1.97. **Note: You will not be ordering this item from The Elijah List. Your order will be processed on The Marko Rubel site. Please contact them directly with any order inquiries or questions about this product.